Bulls Gap School: Highlights - Principal Appreciation! We're blessed with two of the best at BGS! Mr. Palko planned a presentation that expressed our appreciation for Mrs. Southern and Ms. Morelock. Benjamin Franklin, Thomas Jefferson, and George Washington made appearances! Franklin "flew" his kite, full of positive words from our students that described the principals. Jefferson had a "Declaration of Dependence" expressing that not all schools are created equal. 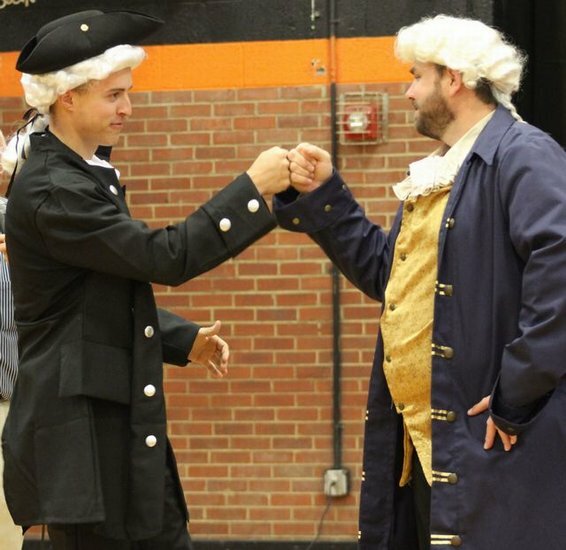 Washington presented the principals with two white horses, and Mrs. Southern and Ms. Morelock took a lap around the gym, at Mr. Palko's urging.